Some vaccines are made available by the government free of cost while others are available for a cost in both private and government hospitals. The most important childhood vaccines are made available by the government free of cost under the Expanded Program on Immunization (EPI). These vaccines are considered compulsory. You can get these vaccines at any government hospitals, upazilla health complexes or union health centers. Even the private hospitals who provide vaccination service lets you avail these vaccines for free. The following vaccines are not covered by the EPI program. These vaccines are considered optional. You may opt for giving these vaccines to your baby for additional protection from some other diseases. However, these vaccines are not free of cost and these may not be available in the government hospitals. How many doses and when? If your baby hasn't been fully vaccinated against an illness, he is not as protected as he could be. Your baby may need several doses of the same vaccine to protect him effectively against each of these diseases. So it is important to follow your child's immunization schedule. Why it is important to get your baby vaccinated? Childhood immunizations protect your baby from potentially serious illnesses at the start of his life. If your child is immunized against an illness, the chances of getting that illness are reduced to a great extent as your child's body has already made antibodies against it. Experts agree that immunizations are safe for your child. All vaccines are thoroughly tested before being licensed for use. Immunizations given by injection are likely to upset babies and young children, making them irritable. 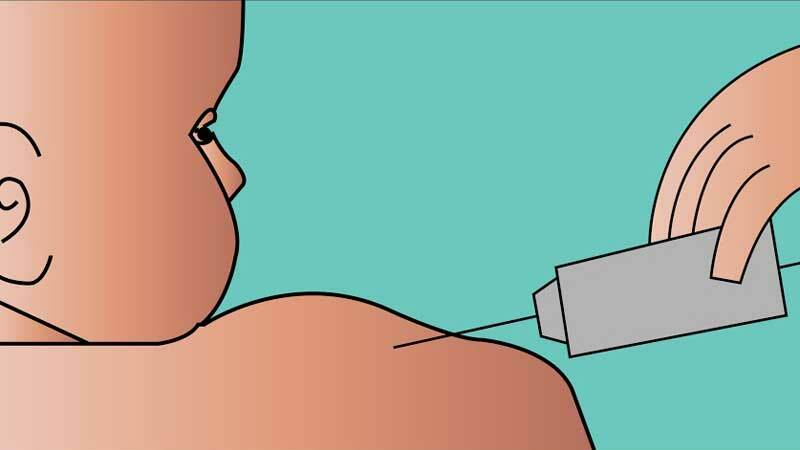 Nursing your baby soon after the shot can help her calm down. Try giving lots of her favorite toys and play with her to distract her from the pain. There will often be redness and swelling around the injection site. Your baby might develop a mild fever.Usually this is nothing to be worried about. However, you should see your doctor if she develops very high temperature or a febrile convulsion.